Best known for his landmark version of the Protestant Bible, James VI (1566-1625) of Scotland, who succeeded Elizabeth I to the English throne, was truly a monarch of the word. From religious prose and verse to political treatises and social works to love poems and witty doggerel, James used writing and the print media to inspire his subjects, govern them, keep his enemies at bay, and even examine his own authority. Until now, the full span of James's work has received little critical attention by political and literary historians. In Royal Subjects, sixteen leading scholars explore the richness of his oeuvre from a variety of perspectives, and in so doing seek to establish monarchic writing as an important genre in its own right. Through its unprecedented look at monarchic writing, Royal Subjects not only enriches our understanding of the reign of James VI and I but also offers fruitful suggestions for approaches to other Renaissance texts and other periods. Daniel Fischlin is a professor in the School of Literatures and Performance Studies in English at the University of Guelph. He is the author of In Small Proportions: A Poetics of the English Ayre, 1596-1622 (Wayne State University Press, 1997) and co-editor with Mark Fortier of Adaptations of Shakespeare: A Critical Anthology of Plays from the Seventeenth Century to the Present (Routledge, 2000). Mark Fortier is an associate professor of English a the University of Winnipeg. He is the author of Theory/Theatre: An Introduction (Routledge, 1997). This is an absolutely splendid book. 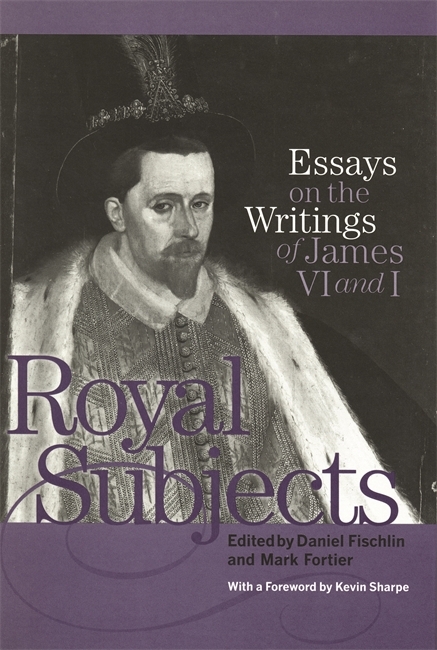 For far too long, the amazing literary output of James VI and I has been regarded, at best, as interesting for its political theory and views on kingship, at worst, as worth noting not for its intrinsic value but because a king put pen to paper. Fischlin and Fortier have put together a collection which at last does its subject justice, and are to be congratulated on doing so.